BSJ | Is a fed bear really a dead bear? For years, around 300 million visitors to the National Parks of the United States are repeatedly told to not feed the wildlife. For years, around 300 million visitors to the National Parks of the United States are repeatedly tempted to offer White-tailed Deer and Black Bears alike a share of their rather poorly assembled cheese sandwiches. The reasoning behind the US Park Service’s (USPS) advice is simple: habituation. Habituation is a biological universal. Simply put, habituation describes when an animal stops responding to a signal that it is continually exposed to; responding to something the individual knows is not a threat is a waste of both time and energy. In a life that the all-powerful natural selection would have you believe deals solely in the currency of time and energy, efficiency would seem to be of the utmost importance. Habituation achieves efficiency. It is why people who live near noisy railway lines can eventually sleep soundly at night, knowing that they are not about to be impaled by an errant locomotive. It is why the boy who cried wolf eventually stopped being heard by his fellow villagers and, away from fiction, it is why the wildlife of US National Parks begin to not regard humans as threats. On the face of it, this seems like fantastic news for animal lovers; bolder animals may approach closer and allow for a closer look. The USPS advice, however, relies on the idea that once Paddington is fed, he will continuously pester other tourists (who are unaware of the previous visitor’s actions) for their marmalade sandwiches. The slogan adopted of “A fed bear is a dead bear” plays off this, informing tourists that habituated bears become nuisance bears and nuisance bears become dead bears. In part, this is true. Black Bears are large animals, capable of inflicting serious injuries on human beings as they wrestle with them for their lunch boxes and rucksacks. 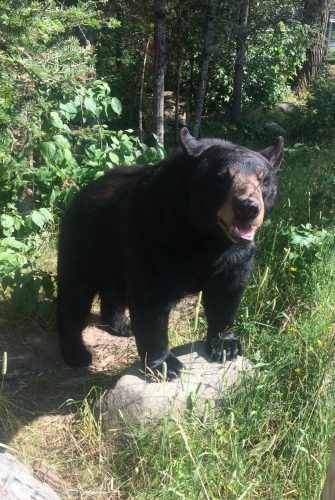 Black Bear fatalities are very rare with only 61 recorded in the lower 48 states since 1900, but the idea that nuisance bears may be unwittingly dangerous is a pertinent one. The misconception about bears and human foods arises when the public come to believe that once Black Bears get a taste for our highly processed, calorific goods, they become fixed and begin to constantly want to dine off our menu. The picture of lazy bears, dependent on human food could not be further from the truth. Countless studies show that Black Bears would much rather gorge themselves deep in the woods on wild strawberries and hickory nuts than rustle through our garbage cans for that still-in-wrapper, fifth cheeseburger you decided was a bridge too far the night before. The same is true for habituated bears. In other words, the bears that don’t associate humans with risk and do not even need to play out that risk and reward trade-off in their minds before heading towards the nearest bird feeders, still prefer their wild menu to our own. Anthropogenic foods are very much a last resort, in times when seasonal foods are short or non-existent. Unfortunately for Black Bears, these lean seasons are becoming far too frequent as the droughts, floods and fires triggered by climate change wipe out or severely deplete their food sources. Hungry bears are coming desperate to our back doors and gardens and the misconception (born from the same slogan meant to protect them) that they are simply lazy, urban bears is preventing the employment of novel management strategies for a population that is on the rise. One such strategy is called diversionary or supplementary feeding. It involves actively putting cheap human food, like beef fat, out for bears to plunder. In doing so, the bears are diverted away from human settlements and there is no need for them to raid our garbage or fight the dog for its dinner. Lynn Rogers of the Wildlife Research Institute in Ely, Minnesota is a strong advocate for the technique when managing bears around campgrounds. The tactic has been rolled out across the world, from dealing with pesky Moose in Norway to making sure there are enough Red Grouse to hunt in Scotland by keeping the cunning Hen Harriers away. These projects, like Rogers, have all been greeted with success. So, no: a fed bear is not necessarily a dead bear. In fact, the very idea may be contributing to more forest-dwelling bears entering our streets. Let the bears have their beef fat, and we’ll keep our marmalade sandwiches and our fuzzy friends for another generation yet.